The Best Civil War Movies -- was yours on our list? And what about all those packaged dimestore toys and the cannons and infantry you saw in catalogs but never in person? Its all here in this issue! Part II: The Centennial Years is the exciting sequel to our Marx Blue and Gray Part One (last Nov/Dec). Voted by PM readers as one of the two greatest playsets of all time, we continue our delux treatment of these spectacular battle sets by providing you the very best of coverage ever conceived for these classics. 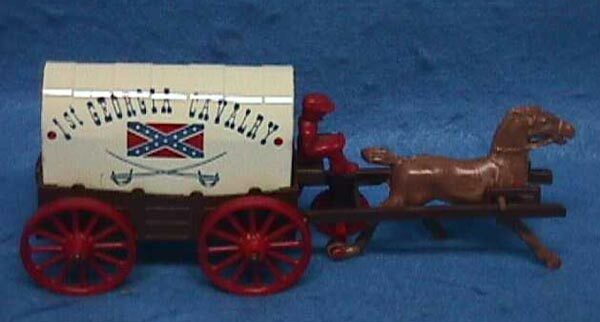 First, you'll be transported back to the early 60's as we pick up where we left off last issue, but now the nation is about to celebrate its Civil War Centennial and toy makers are working hard to present the finest in their lines. You'll be treated to great toy offerings from Marx, MPC, Andy Gard, Lido, and many more. Mark Hegeman steps in with the big guns - the giant Johnny Reb cannon from Remco, Britain's superb caisson and cannon, and a new company to our pages, Payton, offering a giant "Pride and the passion" sized Civil War cannon, the Confederate Caisson and Cannon from 1961. But if you know Playset magazine, you know that is not all. Turn the pages and we deliver more - Timpo, Swoppetts, Giant -- and even the exceptionally rare, never before published TV collectible Gray Ghost set based on the obscure Civil War era TV show as provided by Jim McGough. Next, the classic Marx Playsets take center stage with the really big playsets we all had or wanted. 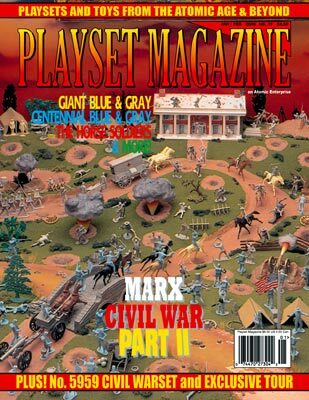 This is the era of the great exclusives: the firing mortars, the firing pistols, the falling horses and riders, there redoubts where so many last stands took place -- you'll delight in our complete, clear and concise coverage of the Giant Blue & Gray, the Centennial and many others. We present these sets so detailed and complete you'll be certain you were looking at them in your own collection, not on the pages of PM! We take real pride in presenting you a quality color presentation, and this time Rick Eber's sets are laid out so you can see all the details and color. And on our cover is Mark Hutsky's great diorama. And there's more -- Brother For Brother in Kathy's My Side Column; And a great review of Superiors Civil War sets by Jim McGough, and the complete Marx Civil War Mold Breakout by Kent Sprecher.